Microwave milk for about 40 seconds, or until warm, about 110°F. In a small bowl, combine yeast, sugar and warm milk. Stir well and let rest five minutes or until foamy. In a large bowl, mix together salt and flour. Make a well in the center and pour in yeast mixture and oil. Mix with hands until a smooth dough forms, adding small amounts of flour as needed. Dough should be tacky but not sticking to your fingers. Knead for about three minutes. Spray a medium bowl with cooking spray and place the dough in the bowl, turning to coat. Let rise until doubled in size, about 1-1 1/2 hours. Cut the dough into six equal pieces and roll out into circles (or ovals) about 4-5 inches in diameter. Bake on a baking stone until golden brown and slightly puffy, about 12 minutes. Serve warm. A year and a half ago, I went with a group of fellow college students to India for a three-week anthropology crash course on globalization. There were about 20 of us in the whole gaggle, standing out like sore thumbs with bulky cameras hanging around our necks and gaping open mouths at the sights of slums and the Taj Mahal. To be honest, we learned nothing about globalization - but we did learn a whole heck of a lot about life, and food. I swore after those three weeks of dipping strange foods into even stranger sauces that I would never eat Indian food again. It just never sat well with me (though I'm sure the sights, smells and sounds around me at the time didn't help). Now, over a year later, I'm slowly coming around again to the idea of gulab jamun, murgh makhani and perhaps the most well-known Indian food, naan. I kid you not, my friends and I spent nearly the whole three weeks eating nothing but naan (except that one hotel we stayed at that served omelettes and apple pie a la mode, which I promise you I ate every day we were there. Oh, and that night we went to Pizza Hut. Best. Pizza. Ever.). To say the least, I was "naan-ed" out when I got home, though I do love the bread. 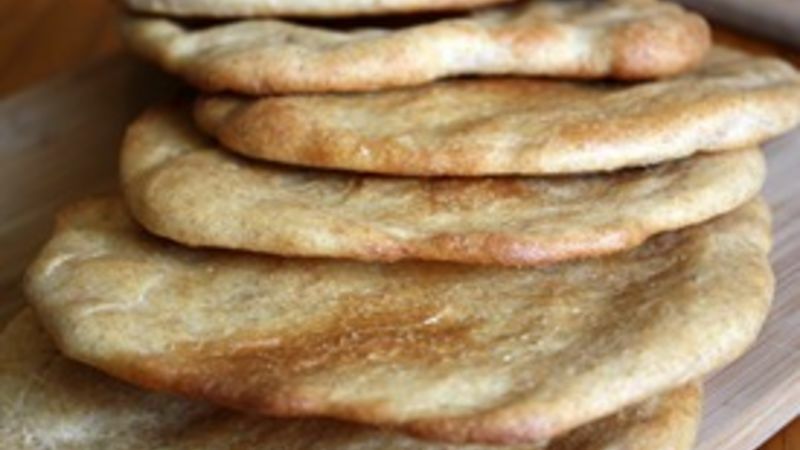 It's like the pita bread of Asia - extremely versatile in taste and texture, and useful as an edible utensil, as well. Plus, it's simple to make but still substantial in flavor. There are probably a billion ways to make naan. Being that I'm partial to healthy foods, I made mine with half whole-wheat flour and half white bread flour. I also decided to use milk instead of yogurt and vegetable oil instead of ghee (clarified butter, something I don't have just lying around the house). It turned out a little differently than what I ate in India (as I'm now an expert on naan, having eaten so dang much of it), but it still sufficed as an incredible shovel by which my husband scooped our rice and potato curry dinner into his mouth. And it warmed me up a little more to the world of Indian cuisine.